Perhaps it’s her freshly shaved head or her deep, husky voice revealing her penchant for heavy starch, but it is hard not to hit “repeat” on Donna Beth Joy Shapiro’s submissions to Expert Village. Her opus is ironing, more specifically what to iron and what to dry clean. She also has video about starch („I take great pleasure in ironing pleated garments“) and other straight forward how-tos about removing wrinkles. The instructional fashion video has it’s place on the web. It is far easier to show someone how a belt can accentuate an outfit than to write about it. Whether it be the offerings on Expert Village, which runs the gamut from how to fold a cowl neck sweater to applying glue to the first false eyelash (the category awkwardly groups fashion, style and personal care), to the hosted style reports on Who What Wear TV. In these sponsored, journalistic-type segments, viewers can learn the latest way to tie a square scarf into the „adult bib“ style (practically state-issue in Berlin), and that Balenciaga started the trend. Shapiro’s authoritative exclamations and real-life wardrobe examples are what make her videos stand out. According to her bio, she’s a historic preservationist and owner of the Old Waverly History Exchange & Tea Room in Baltimore City. Unlike Who what Wears sponsor-flooded „Fashion Closet“, Shapiro uses selections from her own wardrobe for the sake of our wrinkled existences. Her delicate brown rayon dress with subtle pleating, her faded Gap jean shirt with tuxedo details, her leather jacket with rayon sleeves are all revealed to us. One can’t help but wonder, „how long has she had that brown cordouroy sack dress?“, knowing all the while that the next time she sports it, Shapiro will turn heads in Baltimore. The October 2 issue of everyone’s favourite German Language gossip mag gave me an idea for an alternate title for this blog. Their headline for an article about „A Single Man“, Tom Ford’s directorial debut movie project and model Bar Refaeli’s acting debut in a short by Israeli director Haim Bouzaglo? „Mode goes Movies“. 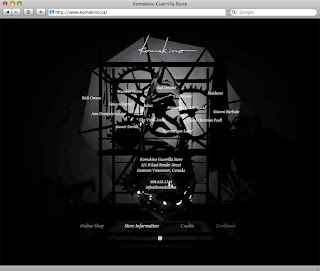 A new pop-up just popped up in Berlin, and the website features some lovely video art from fellow Canadian Jesse Kanda. Darklands is the latest menswear concept from retail ringmaster Campbell McDougall. Similar to the Komakino series of temporary shops he initiated in basements and abandoned spots around Vancouver, finding the store is part of the fun. In order to get to the Berlin shop on Gormanstrasse 7, you must enter through the Seven Star Gallery and make a few wrong turns before located the sleek selections of Italian and Japanese labels in the back. While their cooperation with the film EDGE OF LOVE has been much publicised in the blogs, the Oasis retail chain’s latest film project has got them permanently on my „one to watch“ radar. I’m also going to keep an eye on J.crew, who’s own film series may just need a bit of underground street cred to reach the fringes of their audience. ALTERER is a short film by Jean Francios Carly commissioned by the UK-based womens clothing company. It reminds me of an Alphaville music video in the very best way: it’s moody, the edits look like amateur 35mm camera tricks, and Carly makes great use of a smoke machine. Edgier than what most would expect from Oasis, it makes me want to check out the shop in shop next time I’m at Galeria Kaufhof. Retail chains adding film to their online portals is a growing trend. The short PRAHA, directed by Tom + Coliena that was showing for a while on the front page of Jcrew.com could be best described as a video postcard purchased from a Howard Johnston lobby. A beautiful woman, a hot guy, another beautiful woman and adorable young boy run around the streets of Prague in their multiple, coordinated outfits. Are they late for a wedding? A funeral? A pop-up sale? Whatever’s going on, there are a lot of beauty shots of silk pumps on cobblestones. Better is their Paris video, with a behind the scenes look their photo shoot for the fall 2007 line. Oasis and J.crew meet the challenge of the „retail fashion film“ in similar ways: a video of approximately 3 minutes long, no dialogue, and a soundtrack consisting of a song from a requisitely hip indie band playing from begining to end. What differs is how they use these films. Instead of posting ALTERER on the main Oasis site, the brand chose to launch what they called their „ Autumn/ Winter 08“ film, on their blog. Also, the film is not imbedded in the site like on jcrew.com, but instead plays from YouTube, which allows viewers to easily share it if they wish and add comments. The only thing more cutting edge would have been to stream it from dailymotion or vimeo. Oasis took it a step further and used one of their high street storefronts as a screening venue. This innovation won them first prize in the Evening Standard’s annual window display contest judged each Fashion Week. Jcrew could take a page out of Oasis’ marketing book and use film to show a different side of the brand. While searching „jcrew“ on you tube, I came across some great skate videos of a north beach longboard crew in sydney. Slap a double-breasted merino wool cardigan and a pari of argyle socks on those flyers and you’ve got an underground collaboration I’d like to see on tape. The KIM bar (Brunnenstrasse 10, Berlin Mitte) has a regular film night showing Italian crime films from the 60s and 70s. I checked it out this week with my friend Michaela because I’ve rediscovered my passion for Blaxploitation films from the same era. The movie poster promised just as many cringe-worthy stunts and jaw-dropping fashions as anything starring Robert Roundtree. I was not disappointed. ROMA VIOLENTA (1975) is like CLEOPATRA JONES for the first 50 minutes, and SHAFT for the last 40. Comissario Betti, a much respected cop on the beat during a rampant crime spree, gets sick of and tired of seeing the bad guy get away and joins a group of well-dressed voluntary thugs who do the police’s job for them. He even starts to look like detective John Shaft after he makes the switch from agent on the inside to detective on the outside: his trench coats get longer and his bell bottoms wider. He even sports the monochromatic suit and tighter-than-skin turtleneck combo. Despite the good guys looking so good, I couldn’t keep my eyes of the adorable touques the robbers were wearing. Imagine a knitted ski mask with a brim and a pom-pom on top. They all had them, in different colours, worn with the face-mask part pushed down to the neck like a cowl when they were going about their civilian business, and pulled up so that only the eyes and top of the handlebar moustache peeked out when they were raising a ruckus. I couldn’t help but picture southern Italian grandmas feverishly knitting these as parting gifts for their sons before they headed up North in search of „employment“. I am now officially on the lookout for a similar crochet pattern. I’ll need to watch more Italian crime films to back this up (Bennett, the guy who runs the film night at KIM says he has enough films to keep the night going until next year), another major difference between the two genres is the type of crime. The most popular blaxploitation films are almost always about drug crime, where in ROMA VIOLENTA people were getting shot over a whole lotta furs and pearls. Also, be it for the tiny cars, the winding roads or the lack of traffic information in northern Italy in general, nobody does a car chase like the Italians.